MANILA, Philippines — As bilateral ties become warmer, Russia believes it is time for the Philippines to “diversify” defense and other forms of cooperation with other countries, without damaging its traditional alliances. As part of a blossoming “partnership,” Russia is proposing, among others, a joint project with the Philippines for the production of assault rifles, including Kalashnikovs, in this country. 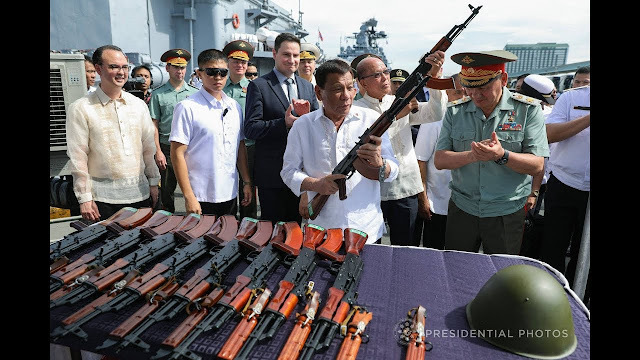 “Last year… we proposed organizing a joint production facility here, to jointly produce Russian assault rifles,” Russian Ambassador Igor Khovaev told “The Chiefs” last night on Cignal TV’s One News channel. He stressed that Russia’s proffered hand of partnership has no “hidden agenda” or political strings attached. The Kalashnikov range of assault rifles includes the AK-47 – Avtomat Kalasknikov or Kalashnikov’s Automatic Rifle, arguably the most widely used of its kind in the world. Developed by Mikhail Kalashnikov, the AK-47 was first used by Soviet forces in 1949. Kalashnikov also produces shotguns, rifles, pistols and ammunition. The proposal is likely to be blocked by the United States, with which the Philippines has a defense alliance. Last month, during a visit to Manila, Randall Schriver, US assistant secretary of defense for Asian and Pacific security affairs, cautioned Manila against buying military hardware from US rival Russia. Schriver issued the statement as Philippine defense officials were reportedly considering the acquisition of a submarine from Russia. Reacting to Schriver’s warning, Khovaev emphasized that the US and other traditional allies of the Philippines should not interfere in the bilateral cooperation between Manila and Moscow and the choices made by the two countries, including defense cooperation and acquisition of arms and weapons.